As the saying goes - 'Sky is the Limit'. This is literally proven by our patron of today - Ms. Monica Seth, who is the First Lady Pilot in the Indian Coast Guard. Desire to touch the sky and fly like a bird. Flying over high seas, guarding the Indian coast against smugglers and poachers has been her daily routine. Being the First Lady Pilot in a purely male bastion hasn't been an easy journey for her. But she took the plunge. Post her flying career with the Coast Guards she pursued higher education in Aviation and currently running an Aviation Management Consulting firm specializing in setup of new Airlines, operations improvement and strategy. In her own words "Anything is achievable if your passion is true, conviction is strong and focus is firm". Through her sheer determination, passion and focus on her goal she has overcome all odds and hence is a true inspiration for many. Tell us some background of your early life, schooling, family background, education. My early life had immense focus on education and as my mother always reminded us three sisters, ‘a girl must be well educated and be independent in life by having a career’. Therefore my focus was on education and goal was to have an interesting career. Being Head Girl of the school and a topper in studies, it wasn’t difficult to choose a path for further education. However, my very supportive father, who also happened to be a hobby Pilot, always wanted us to choose our own path. I remember flying with him in a very small plane (Pushpak) when I was only five years old! But never did I think I could be a Pilot too. It was my dad, who affirmed that it didn’t matter if I am a girl...I could fly too. And then there was no looking back. I finished school and decided to become a Commercial Pilot starting my Flying Training in Amritsar (Punjab) and places such as Ludhiana, Lucknow and Pondicherry. I was the first student to achieve a CPL (Commercial Pilot Licence) in the shortest time. 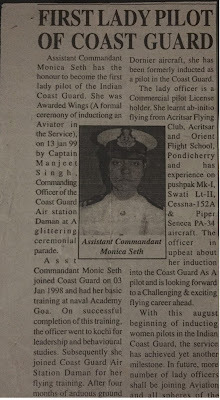 I thought I would eventually fly for an Airline but little did I know that I would be joining Military (Indian Coast Guard). When a friend from Air Force made me aware that Coast Guard was going to induct CPL holder Women Pilots for the very first time, I couldn’t refuse my Dad’s challenge that I could pass the service selection board. And there I was meeting Director General Coast Guard after all the gruelling tests, congratulating me that I had made history by being selected as the first and only Women Pilot to join the first batch. After my career in Coast Guard for nearly four and half years, I took pre mature release and headed to Australia where I got my MBA in Aviation (Griffith University, Brisbane) as well as a Australian Commercial Pilot Licence from Sunland Aviation (Brisbane, Queensland). My source of inspiration for flying was always my father who never let the discouraging society affect his decision to back me up as a woman Pilot. He always taught us to be courageous and treated me like a son. He was supporting in every way but gave me all the freedom to make my own decisions. He always says, ‘Make your own decisions so you don’t ever regret or blame anyone else’. 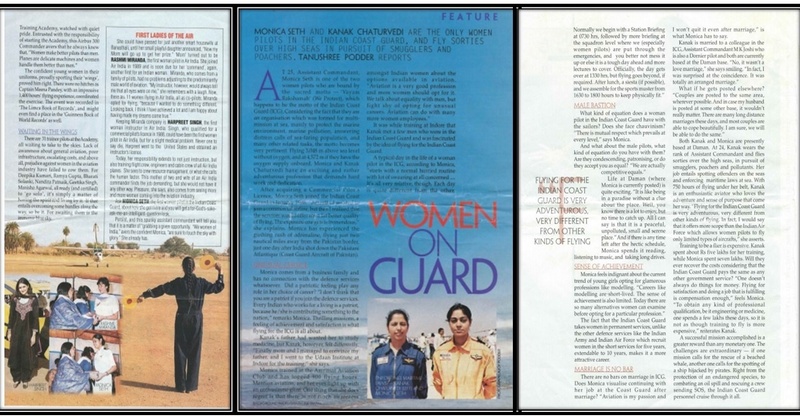 Media Coverage on the occasion of "Wing Ceremony"
Once you had become a First lady pilot in Indian Coast Guard, please share your feeling about it. It was an honor to be selected to serve in the Indian Coast Guard. Becoming the first female Pilot meant more responsibility to prove that women could do equally well as men in the military. The Naval Academy at Goa was a challenging training, after which I was based at Coast Guard Air Station, Daman, for my flying training. Being inducted as an Assistant Commandant, not only did I have flying duties but also officer responsibilities for squadron sailors. I was proud that I was treated quite equally even though I knew I had to prove myself better than the male officers at every step of the career. I also understood that the squadron was not used to having any female pilots prior to me, which is why I had my own set of struggles in the beginning but every day was a rewarding day. I wouldn’t trade any of my challenges or struggles as they made me stronger, more courageous and experienced. Flying the Dornier-228 was such an exhilarating experience that every sortie brought a sense of satisfaction and pride in being a woman- an Indian Woman! 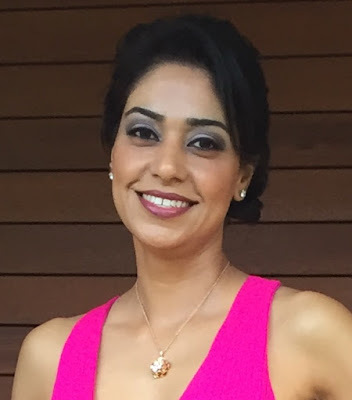 Editor's note: Monica Seth's achievements have also been acknowledged in press and media. 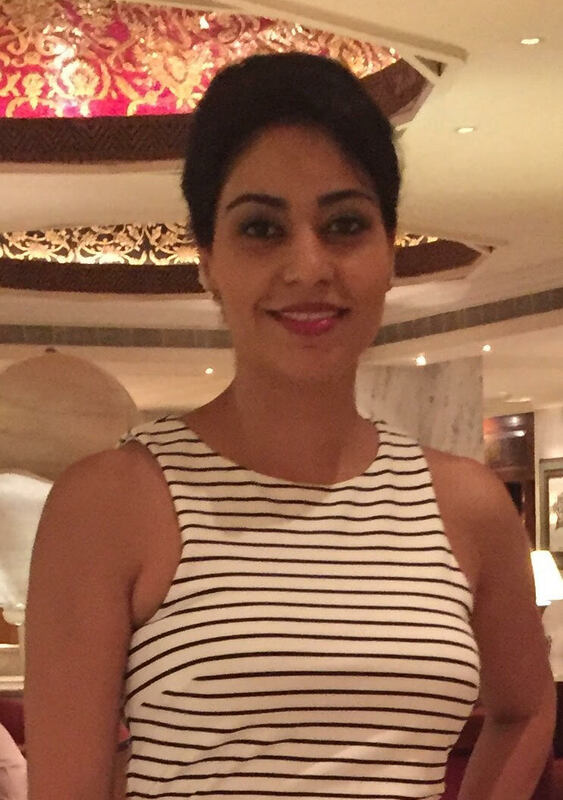 What was the reason to move from Pilot to Aviation Management Consultant? I took pre mature release form Coast Guard for some personal reasons, however, aviation was a passion and before attempting to join a commercial airline, I decided to further my education. I was looking for aviation specific studies and found that Australia offered MBA (Aviation). I had no aspiration to live in Australia but I got offered a management role in Virgin Blue (now Virgin Australia) and I decided to get my share of experience before heading back to India. Life is full of surprises and before I could pursue my plan, I got pulled into a very successful career as an Aviation Management Consultant. After working with CAPA (Centre for Asia Pacific Aviation, Sydney) and LEK Consulting (Sydney), I decided to head my own Consulting Company (Altitude Consultants) based in Sydney. What are some of the challenge women face in this industry? I had my experiences in the aviation industry starting 1995. There were many challenges even though some women had already set foot in Indian aviation much sooner. It was definitely not an easy road to success as women do have to tread the extra mile, men are still trying to accept and acknowledge our abilities as an equal and if you are the only or the first one in a male dominated field, you have to stick to your ‘never give up’ conviction. I am hoping that these many years on and with lots more women now in this field, the challenges would be less. However, being a career woman in any field always seem to require that extra bit of effort to prove your mettle and sustain your position. The diversion from active flying to Consulting helped a lot in balancing personal and professional life. I am a workoholic and would hate to sit idle. So having my own business gives me the flexibility to be a mother, wife and a Consultant. 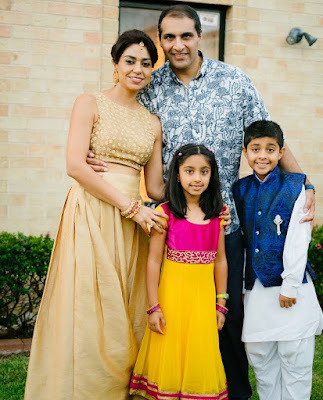 I am blessed to have a very supportive husband and two wonderful children. We all make sure we have ample family time and a healthy work- life balance. Lastly what is one advice that you would like to give young women out there who are thinking of taking Aviation field or flying as a career? With boundless opportunities in this day and age, my only advise to young budding women would be to look ahead, spread your wings with ‘never give up’ attitude. Aviation is a wonderful industry where every woman should have a chance to soar high, be it flying or corporate. Anything is achievable if your passion is true, conviction is strong and focus is firm. I wish every interested woman, a very successful and satisfying career in Aviation. Thanks for putting up the article on about this first Indian Pilot. I am very impressed with her and yes with her choice of occupation. Great lady.